the antimicrobial’s pharmacodynamic (PD) properties. One factor that is amenable to some degree of modification by the healthcare provider is the pharmacokinetics (PK) of the antimicrobial. “the characteristic interactions of a drug and the body in terms of its absorption, distribution, metabolism, and excretion” (Merriam-Webster”), or less scientifically as “what the body does to the drug” , as opposed to pharmacodynamics, which is “what the drug does to the body”. While we cannot influence how a specific drug is metabolised, we can influence how we administer a drug (the route, the time of day, the dose, the frequency and the speed of administration). 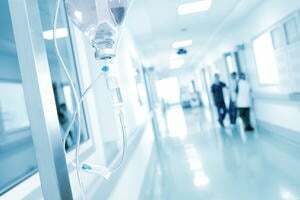 With the recent increase in the prevalence of multidrug-resistant bacteria in many parts of the world and the lack of new antibiotics in the foreseeable future, there has been increased interest in optimising the administration of existing antibiotics in order to improve patient outcomes (especially in critically ill patients), reduce toxicity and prevent, or at least, decrease the probability of selection and emergence of antimicrobial resistance. In order to optimise the PK/PD of antibiotics, good basic knowledge about PK/PD in different patient populations is necessary. It is important to keep in mind that PK/PD of a specific drug may differ among newborns, children, the elderly, the critically ill, the morbidly obese, patients on renal replacement therapy, different ethnicities, the two sexes, and patients with specific diseases such as cystic fibrosis, since the absorption, distribution, metabolism, and excretion of drugs may vary among these groups. Unfortunately, detailed PK/PD data are lacking for numerous “old” antimicrobials since they were marketed at a time when such data were not required for authorisation by regulatory authorities and technical capabilities were limited (e.g. with regard to accurate measurement of drug levels and PK/PD simulations by computers). In addition PK/PD data may exist only for specific populations (e.g., healthy volunteers) and may thus be difficult to extrapolate to other populations. Therapeutic drug monitoring (TDM) - i.e. 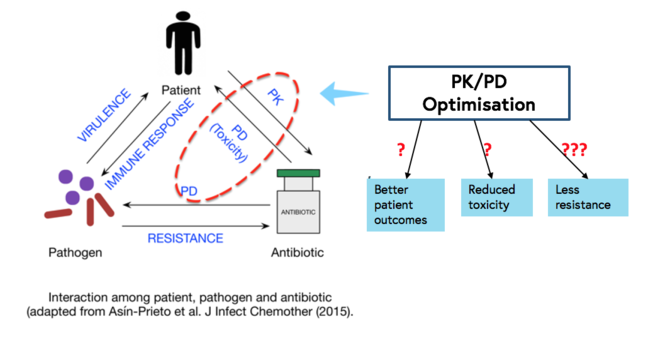 the determination of the concentration of a drug in a body fluid (generally the blood) - has become available for many antimicrobials, greatly facilitating the task of PK/PD optimisation; since even within a specific patient population there are large inter-individual variations in PK. The ratio of the “area under the (concentration-time) curve” (AUC) over 24h to the MIC (AUC0-24/MIC). Time-dependent antibiotics, such as beta-lactams, are most effective if their concentration is maintained as long as possible (but at least 50-60% of the dosing interval for beta-lactams) above the MIC. An increase in concentration more than four to five times the MIC does not usually influence efficacy but may increase toxicity (e.g., seizures). 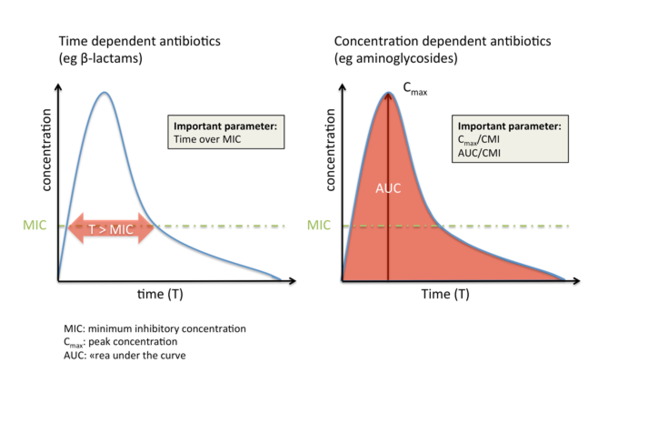 In contrast, concentration-dependent antibiotics such as aminoglycosides are most effective if they reach a high concentration compared to the MIC at the site of infection, while the time that they maintain this concentration is less important. Many antibiotic classes (e.g., glycopeptides and fluoroquinolones) fall, however, into the third category, where efficacy depends both on concentration and time. While these principles theoretically apply to all drugs, PK/PD optimisation has been most applied in clinical practice with regard to beta-lactams and aminoglycosides. Based on the principles mentioned above, many now advocate the administration of beta-lactam antibiotics via prolonged (more than one hour but less than 24 hours) or continuous infusions to maximize T>MIC. If this approach is chosen, it is essential to administer a loading dose to assure that target levels are reached rapidly (otherwise it may take a long time to reach the desired target concentration). 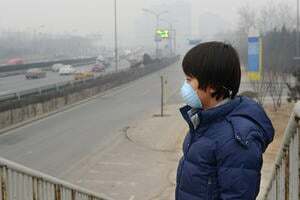 In addition, the stability of the antibiotic needs to be considered. While some drugs are stable for 24 hours at room temperature (e.g. piperacillin/tazobactam) others are only stable for three to four hours (e.g. imipenem) requiring either frequent changes of the perfusion (if administered as continuous infusion) or administration as prolonged infusion (rather than continuous). Incompatibilities with other drugs administered intravenously and practical concerns (mobility of the patients, number of available lines) also need to be considered. While the concept of continuous or prolonged perfusion of beta-lactams (combined with TDM) is appealing and based on a strong theoretical basis and rationale, it needs to be mentioned that the clinical evidence that PK/PD optimisation leads to improved patient outcomes is still relatively weak; it is conceivable that the advantages of PK/PD optimisation apply primarily to infections with organisms that have relatively high MICs to many beta-lactams (e.g. Pseudomonas aeruginosa, carbapenemase-producing enterobacteriaceae etc.). Further, some skepticism is warranted as to whether this approach has a major impact on the control of antimicrobial resistance. Nevertheless, given that the disadvantages are minimal, continuous or prolonged perfusion of beta-lactams has become standard of care in some centres and hopefully evidence for its usefulness will soon emerge. TDM for this drug class has long become routine clinical practice in many centres, mainly with the aim to decrease toxicity (mainly nephro- and ototoxicity). Aminoglycosides are the classic example of concentration-dependent antibiotics with Cmax/MIC (>eight to ten for optimal efficacy) as the most important PK/PD index, making once-daily dosing of this drug class the logical choice. In addition, this mode of administration may also reduce nephrotoxicity. Some uncertainty remains with regard to the optimal mode of administration when synergy with beta-lactam antibiotics against Gram positive organisms is desired, such as for the treatment of enterococcal endocarditis (the 2015 US and European endocarditis guidelines, for example, differ on this issue). 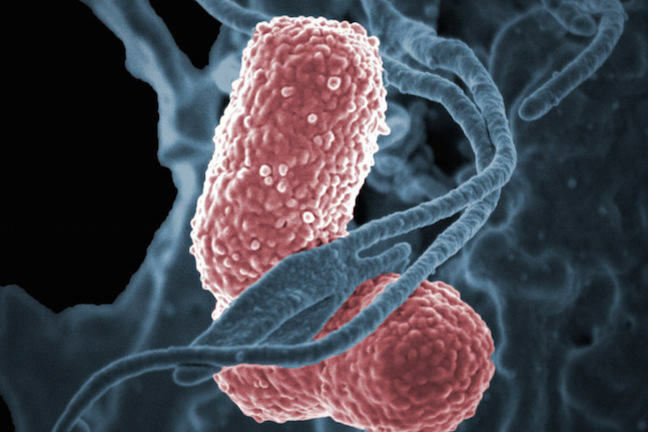 Based on animal studies, multiple daily dosing of aminoglycosides is still advocated for these situations, although guidelines now often recommend twice-daily dosing instead of three daily doses, and some guidelines even favour once-daily dosing even for Gram positive infections. If once-daily dosing is used, peak levels do not need to be monitored, as the high dose given ensures adequate peak concentrations. Only trough levels need monitoring to rule out accumulation of the drug and thus potential toxicity.